Download a Preview of Dance Camp here! We hope you join us for a fun and creative summer full of dancing and making new friends. We ask that each dancer brings a snack and water bottle to class each day. Also, if you child will be at camp for the full day, 9:30AM-3:30PM, please send a sack lunch in addition to two snacks. Come and spend some summer fun with your favorite Disney tunes. This is a great camp for boys and girls. During our 4 day camp we will dance, sing, and play to many Disney greats. Learn the basic dance steps of jazz, hip hop, and ballet while moving your body to the beat and strengthening coordination and creativity. Come join the FUN! Let your imagination soar as you twirl to classical ballet fairy tales. 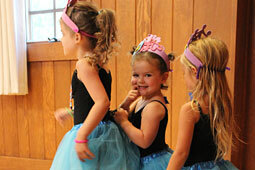 Students are taught basic ballet steps, and learn to tell the tale through dance. Students create and take home their own magical crafts. We will read stories such as Cinderella and Sleeping beauty and learn dances that will make each dancer feel like a princess! Lunch hour is included if registering for both an AM and PM camp, if you are only registering for AM or PM and want to stay the extra time, please register for the extended lunch hour! Come join the happy trolls for a week of summer fun. Adventure for all the little trolls as we dance to the fun songs from the movie. We will make crafts, new friends as we dance and create summer memories. This wild story of rainbows and fun will end with a showcase for parents on the last day as we present our adventurous troll story. Jazz it up, up, up.....If you like to move fast, this is the dance camp for you. We will do lyrical, jazz, and hip hop - this is great for beginners or continuing dancers. 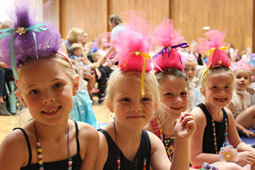 We will make friends, have fun and create dances to share on our final day of camp. Dance the week away learning many different forms of dance. We will begin with stretching then move to ballet, jazz, tap and hip hop. We will cover each style in the 4 days. This is a fun way to try different styles of dance, have fun, and preform on the last day. Dancers will learn dances to songs from the movie Moana such as “How Far I’ll Go”, “We Know The Way”, and “You’re Welcome”. We will read stories about Moana’s adventures, make Hawaiian crafts, and learn ballet and jazz dance technique. Ever want to make a music video like on YouTube or MTV? In this class we will storyboard, dance and film to create a final day project to share. We will learn the process it takes to bring dance to life using the medium of film. This will be a faced paced, fun camp exploring the process of creation. Team building and friendship will be formed in this new camp. Come create with us! Fancy Nancy loves to dress up and use her imagination. We will too each day as we read her stories and create our own costumes- the fancier the better. We will dance to fancy music and bring to life a fun show on the final day. Come be fancy with us this summer. From Frozen, Annie, Beauty and the Beast, Lion King and Wicked, Broadway is full of dancing music. Come join this camp where we will dance to the greats of Broadway each day becoming characters from the musicals. Our final day show is sure to WOW the audience as we share all we have learned with our family and friends.